Dane Goodman is one of the Central Coast’s most accomplished artists. Working in a broad range of media, his artwork has been shown throughout the United States and is in numerous museum and private collections. He has been a lecturer and artist-in-residence at universities, colleges, and museums. A recipient of the County of Santa Barbara Individual Artist Award, he has also been nominated for the National Award in the Visual Arts and the FOCA Award in LA. He has twice served as a panelist for the National Endowment of the Arts. Goodman has worked to promote and nurture Ventura and Santa Barbara artists. 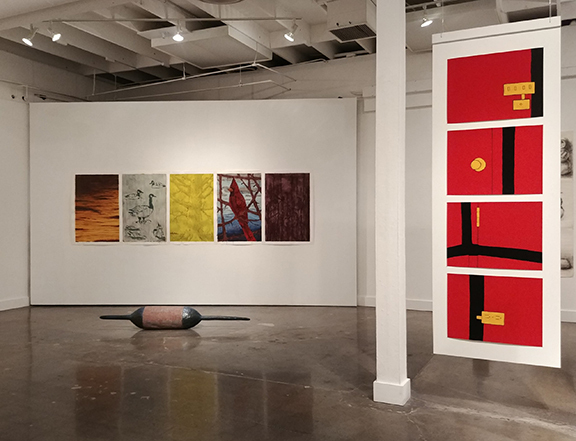 As director of the Atkinson Gallery at Santa Barbara City College, he produced outstanding exhibitions, including FOTM documented artists Colin Gray, Matt and Monica Furmanski, Keith Puccinelli, and Jenchi Wu. His private agency, CARDINAL, recently published a limited print by the Ventura artist, Laura Krifka, that entered area museum collections. Dane Goodman’s exhibit, Consorts, at the College of Creative Studies Gallery, UCSB, closed October 13, 2018. Goodman’s documentation took place in 2018 and was sponsored by Debra McKillop. The AfterGLOW was hosted by Delia Gorey and Larry Manson.